Trucy shouted right in my face. I instinctively took a step back. Trucy flipped her cape and spoke holding her silk hat. Come to think of it, Apollo did 'vocal training' every day. His natural speaking voice was loud enough that I don't really think it's necessary, but Apollo always did his vocal training with vigour. Athena shouted with a pumped up expression. Their loud voices were giving me a headache, but their passion got through to me. They were also desperate to win an aquittal for Apollo. I stated matter of factly as Trucy stared at me blankly. I'll be fine. I've gotten out of tighter spots than this before. I just need to believe in my client to the bitter end and go in all guns blazing. The trial is finally beginning. Naturally, the judge is sitting at the highest point in the courtroom. The prosecution and defence take up positions on opposite sides of the courtroom. The prosecution tries to prove the defendant's guilt. While the defence pleads for the defendant's innocence. Both parties present evidence and witnesses and point out contradictions in each other's arguments in order to reach the truth. Then the final verdict is handed down by the judge. Normally the judge would go straight into the court proceedings, but today he made a small preface with an odd expression. I spoke with my chest puffed. I thought I'd made a pretty cool statement there – But an even cooler line came from the prosecution. The judge widened his eyes as he looked as the prosecution. The prosecutor closed his eyes as he played some riffs on an air guitar. No, I don't think a trial requires music... is the response I'd like to give right now, if not for all the swooning in the gallery. By the way, the viewing gallery is completely filled with women today. The prosecution is being represented by Prosecutor Klavier Gavin today. He's a tough opponent. At first glance, you'd think Prosecutor Gavin was a rock star rather than a prosecutor. Anyway, he's showy, flashy and good looking. In fact until recently he was both a prosecutor and musician as the head of the band 'The Gavinners', but due to certain circumstances the band has since been disbanded. Now he's a full time prosecutor. However his love and passion for music still seems to be going strong. When he's prosecuting a case, his female fans turn up in droves. While the gallery's reactions have no influence on the verdict, it does make things harder. Athena encouraged me with clenched fists. Athena was at the defence bench with me as my assistant. ... Yeah, I'm not sure that's quite right. The judge was slightly taken aback having little familiarity with rock, but he regained his composure and solemnly banged his gavel. Prosecutor Gavin nodded and snapped his fingers. The judge gave a deep nod. The judge didn't really have any understanding of musical terminology. ... Just say that from the beginning. The judge finally regained his understanding. The one who took the witness stand was the baggage inspection officer. The inspection officer began his testimony in the same apathetic lifeless way as anything else. The judge made an enquiry. ... It seems the judge always forgets to remove his belongings. Prosecutor Gavin made his own elaboration. At the judge's encouragement, Mr. Sacco began to speak. The judge let out a deep sigh. No, my imagination isn't going to break his testimony. I need to gently press him in order to find some contradictions. I went straight into the cross examination. I believe that Apollo wouldn't lie to me about this. Which means... there's got to be something fishy about Mr. Sacco's testimony. Mr. Sacco denied it with a sneer. I nodded and looked to Mr. Sacco. Mr. Sacco begrudgingly went over his testimony again. I cut the testimony off. Mr. Sacco clammed up in shock. Mr. Sacco was beginning to lose his cool. Alright, I've got a reaction. Mr. Sacco's demeanour changed completely from his previous lifelessness. He had lost his cool and his gestures became exaggerated. Mr. Sacco shouted completely losing his composure as he pulled something yellow from his pocket. As he shouted, Mr. Sacco was kicking his feet up in the air. It was like he was playing soccer right there. Mr. Sacco realised his fatal mistake. He went pale and huddled up. I spoke nice and slow. Mr. Sacco clutched his head and fell to his knees. He whispered his excuses in a frail voice. I turned to Prosecutor Gavin. I could practically hear his teeth grinding as he glared at me in frustration. I carefully built my provisional scenario. Prosecutor Gavin shouted sharply, having regained his composure. True, that point is a mystery. First the victim was stabbed, then Apollo picked up the weapon, then immediately after that the victim collapsed... The order of events seems off. Why is that? After thinking it through, I settled on a theory. An incredibly loud voice echoed through the courtroom. But what surprised me wasn't just how loud the voice was. But it came from an unexpected source. Apollo's usual lively voice came from the defendant's seat. I wasn't the only one dumbfounded. The judge spoke with his eyes wide. Apollo spoke clearly as he stood up. ... Apollo... What are you doing...? The judge shook his head with a fierce expression. The one who said this was Prosecutor Gavin. 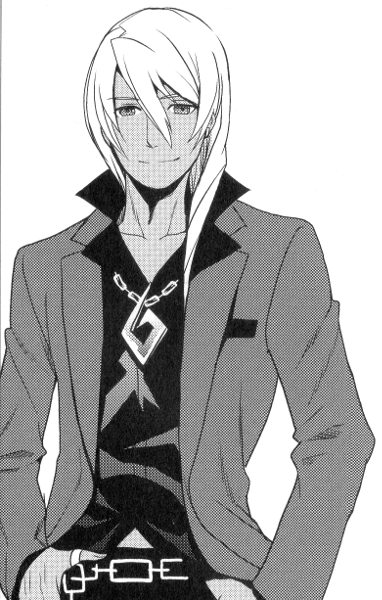 He continued, looking at Apollo with an amused expression. Herr Forehead is Prosecutor Gavin's nickname for Apollo. Apollo does have quite a forehead, so it's fitting. The judge had a blank stare as he granted Apollo permission to speak. Unlike other prosecutors, Prosecutor Gavin puts great importance on 'uncovering the truth'. For many prosecutors, the truth is merely a secondary concern to getting a guilty verdict. Their main concern is improving their reputation at the prosecutor's office. But Prosecutor Gavin is different. He has a pure and simple desire to uncover the truth. I admire the way he clings to having justice served, even when it involves testimony detrimental to the prosecution's case. But that's precisely what makes him a fierce opponent... His single minded desire for the truth, while admirable, means that he never lets up in his pursuit. Apollo confidently took the witness stand. The judge spoke with a look of disbelief. Apollo have his head a big shake. The judge spoke to Prosecutor Gavin with bewilderment. The name caught on with the judge. After requesting “Please don't call me Herr Forehead.”, Apollo began his testimony. ... The same story I heard at the detention center. The judge cocked his head. ... There's just one suspect. One person who could've gotten close enough to touch the victim. It would allow me to confirm the theory 'the poison caused numbness at the moment the victim was stabbed, meaning he didn't feel anything at the time' which I suggested earlier. Despite Apollo's claim that 'nobody else came near him at that time', it's only natural he wouldn't be willing to suspect a friend. If I cast suspicion on him, I may trample over Apollo's friendship. But – My only option is to seek out the truth. Apollo's expression stiffened as I spoke. Prosecutor Gavin shut me down immediately. I let out a pathetic scream. My theory that Ramon could have been the culprit crumbled immediately. Prosecutor Gavin closed his eyes as he spoke. He coolly played his air guitar... Ugh... He pisses me off. Athena whispered to me as I wallowed. Still reeling from the shock, I looked to Athena with hollow eyes. I felt like a ray of sunshine had broken through the clouds in my heart. That's our Athena. She picks up on the fine details. I raised my hand and sought permission to make a statement. Apollo gave a clear answer, despite his bewildered expression. I looked at the document in my hand. The defendant – Apollo, had picked up the ice pick with his left hand. If he were to stab the victim from his position, the wound would be on the right side. Prosecutor Gavin's calm expression twisted. Thanks to Athena's nice assist, we've won back a few points. However, Prosecutor Gavin immediately began his rebuttal. I gave a composed nod. My words caused a great commotion in the courtroom. 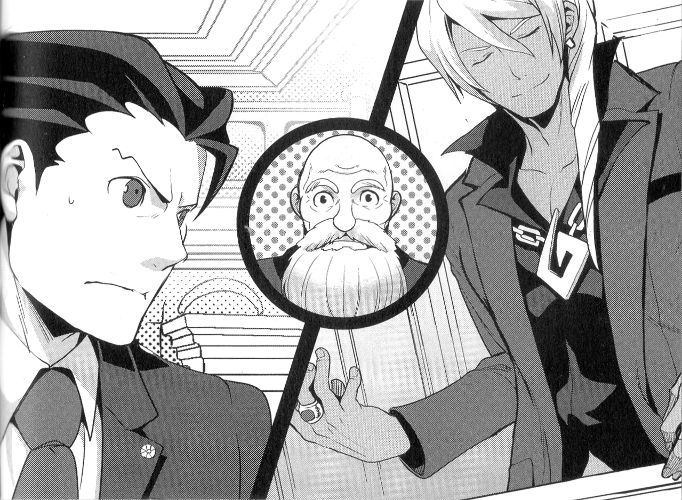 The judge, Prosecutor Gavin and even Apollo looked dumbfounded. When the victim shouted and collapsed, only Apollo was beside him. And I know Apollo isn't the killer. Ramon seemed the most suspicious, but with the effects of the poison known, he's not a viable suspect. Which means – this is the only path that makes sense. Despite how ridiculous it may seem. Silence suddenly enveloped the court. A silence which was broken by the judge's voice. I slammed the defence bench as I raised my voice. I extended my hand out in front of myself, pointing at the prosecution. The gallery erupted. I puffed up with pride. ... I've got great confidence in my ability to bluff my way through a trial. If I show any nervousness, I'm sunk. Athena whispered to me as I was thinking. ... Eh. What the heck? ... It was a solid statement... But I couldn't afford to back down. Prosecutor Gavin made a glamorous gesture with one hand. His fangirls in the gallery all sighed. I turned pale as I realised my oversight. I screwed up. I can't believe I missed something so obvious. It's just as Prosecutor Gavin said. All the people in the lobby had already gone through the metal detector. No matter how small the needle, the metal detector would have reacted. Which means they couldn't have had a concealed weapon. This could be decisive. N-No. I can't give up yet. Think... I have to think. Is there any way to have carried the weapon without setting off the metal detector? No, that doesn't work. The machine wouldn't be tricked by having it concealed that way. And they'd notice immediately if the power had been cut. The judge cut in on my silence. I squeezed out my voice. I can't end it here. Apollo couldn't possibly be guilty. Prosecutor Gavin stared at me intently. His eyes seemed as if they wanted me to come up with a counterargument. But no matter how hard I think, I can't come up with a way to carry metal through the metal detector without it being discovered. It's times like these... I need to turn my thinking around. I'm not trying to think of how to fool the metal detector. I'm thinking of a way to pass through the metal detector without giving up the weapon...! At that moment I had an idea strike like lightning. I turned and shouted at the judge about to bring down his gavel. Prosecutor Gavin looked at me with amusement. A certain person's appearance came to mind. I leant forward as I spoke. Prosecutor Gavin furrowed his brow. Athena seemed to recall as well. “Ah, her...!” she whispered as she looked at me.